The Apple iPhone XR was released, in their words, to bring Apple technology to a broader audience. Being one of the giants in the mobile world, new Apple releases always cause something of a stir, and this year they release three handsets to the delighted of the waiting audience. The iPhone XR was released, in their words, to bring Apple technology to a broader audience. They explained that in the same vein as the SE the iPhone Xr is a cut down version of their new flagship phones, which enables them to offer it at a lower priced tag, thus being accessible to more people. That said when you delve deeper it becomes clear that this is a fantastic handset that actually offers many of the same features and new technology that Apple has proudly unveiled this year. The changes they have made are also well thought out and do not detract from making the Apple XR a really clever piece of kit. It was likely that there would be changes to the screen of the iPhone XR, so it comes as little surprise to find an LCD screen rather than the OLED screen used on the high-end models; however, this is a superior LCD screen because it has been upgraded to a Liquid Retina, never seen before. In terms of size, the handset sits in the middle of their flagship phones at a substantial 6.1inch handset that boasts the true edge to edge infinity viewing with backlight. In place of bezel edge, Apple has opted for a notch at the front which is where you will find the front-facing camera and FaceID, and it works well not detracting in anyway from the massive screen which has 1792x828 resolution and 326ppi. The screen features True Tone which is technology that automatically adjusts the whiteness of the background to ensure images are displayed as true to life as possible. The screen is toughened glass to ensure that it is the most durable, and around the edges, you will find the aluminium band. 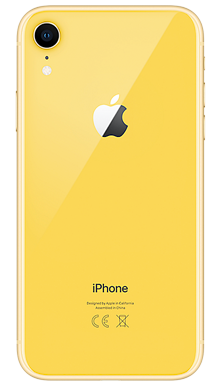 The handset comes in a range of colours which again is not something Apple does often and was last seen in the iPhone 5C. For the iPhone XR, Apple has chosen a flagship red, then yellow, blue, coral, black and white. Apple has added their best water resistance with the ability to survive submersion of up to a metre for half an hour. Their website boasts the ability to survive tea and coffee spills which is helpful if you tend to be clumsy. Audio is something that Apple does well, so the iPhone XR is no exception. The handset has a great speaker range which works well for not just audio playback but calls, and the quality via headset is also top notch. There is no headphone jack as Apple removed these and show no sign of replacing but wireless headphone either using their proprietary technology or Bluetooth gives an outstanding performance too. On the back of the iPhone XR handset, you will find a single camera which is to be expected for a handset that the manufacturers are promoting as slightly cut down, but this is still a 12MP lens and offers a software-enhanced photographic performance that is first rate. The front-facing selfie camera also performs well. 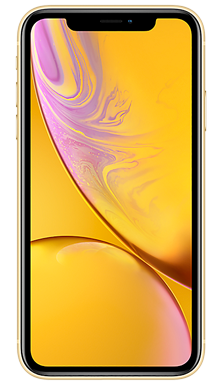 In terms of processor, and something of a surprise, Apple has equipped the iPhone XR with the same A12 Bionic processor seen in the iPhone XS and iPhone XS Max, meaning that the performance is outstanding and users have access to the same gaming and augmented reality features offered thanks to the Neural Engine technology. As the infinity screen does not allow for the fingerprint scanner, Apple had the choice to move it to the rear or leave the FaceID technology in place, which is precisely what they did. The superior performance of the FaceID leaves this phone able to compete with phones at a much higher level and gives access to things like Apple Pay. 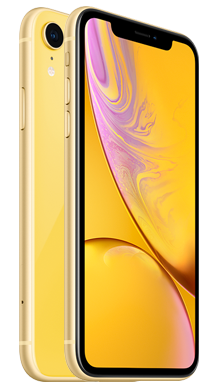 The iPhone XR has enhanced haptic responsive, creating a responsive feel. This makes the iPhone XR an excellent handset for mobile gaming which has taken off over the last 12 months. The great news for iPhone fans is that gaming developers often prefer the iOS platform and release many great games, including the newer AR games on this platform before any others. In terms of memory, you have a choice between 64GB, 128GB or 256GB meaning plenty of storage choice options. The iPhone XR comes with a standard lightening changer but also offers wireless charging on a par with all the latest Apple releases. For a phone proclaimed to be cut down, the iPhone XR has a massive amount of functionality and technology packed in. 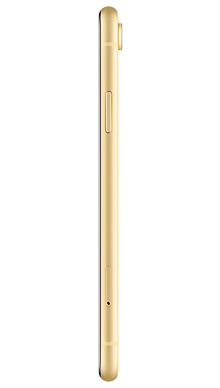 There is nothing inferior about this handset in any way, it is a brilliant phone that has a reasonable price tag meaning it is going to be in demand. With so many of the latest features firmly in place, Apple has really outdone themselves with the updated version of the SE and die-hard fans and newcomers alike are going to love it. 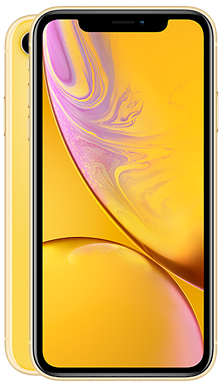 Our Metrofone team have been hard at work to ensure that they locate the best deals for all handsets and the iPhone XR is no exception, so you will find a great range of deals to choose from. For any questions you might have about the iPhone XR, or if you have questions about any one of the specific deals with Metrofone, then why not call one of our excellent customer service team today, on 0333 900 1144.